It was first settled in 1763 by pioneers from North Killingworth, Connecticut. Absalom Kelsey was one of the earliest settlers. The first blow in clearing the forests was struck by Absalom Kelsey on the D.F. Pike farm at the foot of Claremont Hill, Newport, New Hampshire. At that time, the Connecticut River was the only route for travel, until a road was cut through the wilderness to Charlestown in 1767. The following year, the first gristmill was established. 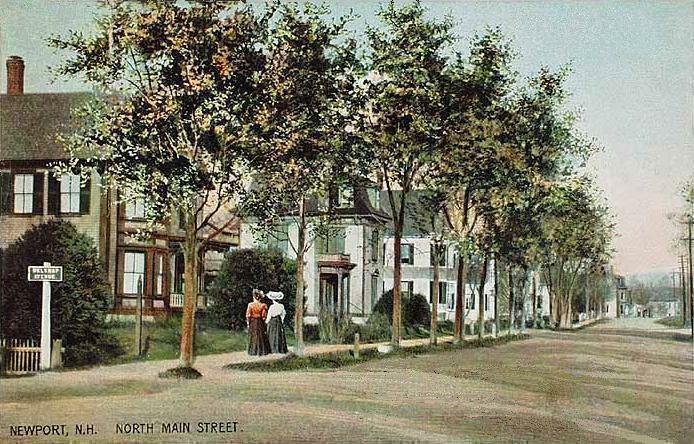 But dissatisfied with treatment by the state government far beyond the mountains, Newport in 1781 joined 33 other towns along the Connecticut River and seceded from New Hampshire to join Vermont. George Washington, however, would dissolve their union with Vermont in 1782, and the towns rejoined New Hampshire. With excellent soil for farming, and abundant water power from the Sugar River and its South Branch to run mills, Newport grew prosperous. The first cotton mill was established by Colonel James D. Wolcott in 1813. Local cabinet making flourished, producing much fine furniture. And then in 1817, perhaps inspired by the Erie Canal, businessmen proposed digging a canal to connect the Connecticut and Merrimack rivers—beginning with the Sugar River, and using its source, Lake Sunapee, as a reservoir. The plan was abandoned before it got started. In 1871, the Sugar River Railroad connected to Newport from Bradford. But the river was recognized as central to industrial development, and in 1820, mill owners from Claremont, Sunapee and Newport united to create the Sunapee Dam Corporation, which built a dam to regulate the Sugar River's flow, running mill machinery even during drought. This plan worked, and over 120 water wheels would turn along the stream's course. By 1859, when the population was 2,020, Newport had three woolen mills and two tanneries It also had the Sibley Scythe Company, established in 1842, which manufactured the scythes that cleared jungle during construction of the Panama Canal. It closed in 1929.